Sculpture Size: 36 X 24 X 20 in. 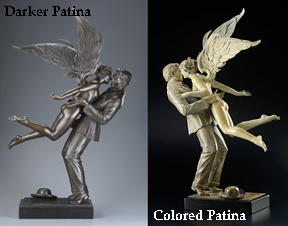 Shown in the Traditional Florentine Patina but also available in Colored Patina or Darker Patina. Years ago, while I was trapped in the Zurich airport during a huge snowstorm, I had a rather interesting experience. Because we could not get to hotels, my fellow travelers and I spent the night sleeping on the floor waiting for the storm to pass. These were primarily business men from all over Europe trying to make their connections home or to their next meeting. I saw these exhausted men, most in suits, lying like fallen soldiers in some chrome and glass battlefield. As I fell into a troubled sleep, I dreamed that all of these tired business travelers were visited by their angels that held them and gently kissed away their despair and loneliness. But, like many innocent beginnings, one kiss led to another and the “Angel Affair” idea was born. As I awoke to the announcement that flights were beginning to move again, I swore I saw the last angel reluctantly leaving her companion. Only the pink soles of her feet were visible as she flew away. She left a feather by her friend’s side, but in his rush he didn’t notice. So, without guilt, I kept it. I still have it to this day, although there are times when it becomes so transparent that I can only see its faint glow in a dark room. Was my angel there? Of course, but that is another story!